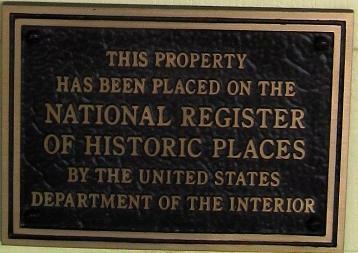 Historic Groton Bank houses and buildings more than 75 years old are eligible for plaques when research determining their first permanent owner (not necessarily the builder) and the year (usually within a 6 year span) that it was built. The Groton Bank Historical Association's plaques are an oval shape with a silloette of a Revolutonary War soldier at the top, the name of the original permanent occupant in the middle and the year it was construted below that. Just the year appears on the plaque if it is determined plus or minus 1 year. Circa, c., is used if the date is generally known plus or minus 3 years. Most Groton Bank houses and other structures are listed on the National Register of Historic Places. They are elegible for plaques desinating that. 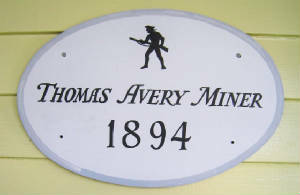 Such plaques like the one pictured to the right are available from several commercial sources. Dr. Amos Prentice, "Mother Bailey"
Wm. Gray was a merchant owning a store on the west side of Thames St at the foot of Broad St.